You may be forgiven for thinking that a lecture about curating Paddy’s archive could be a little dry, but for the one hundred and eighty people who attended last night’s event at the Hellenic Society in Paddington it turned out to be nothing of the kind. 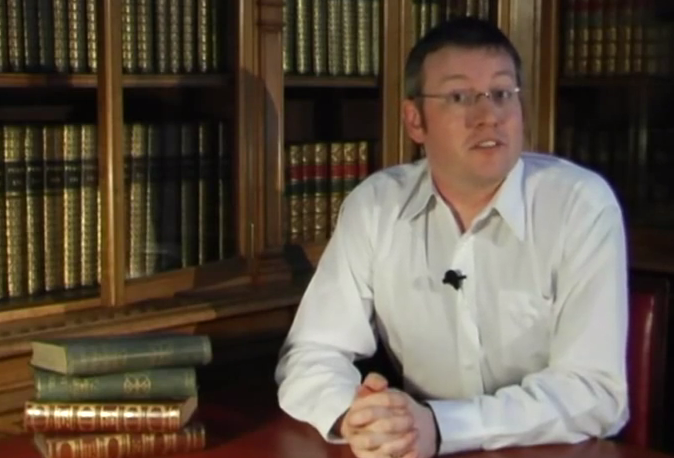 David McClay is the National Library of Scotland’s curator of the John Murray archive. He had travelled down to London to give the inaugural lecture of the Patrick Leigh Fermor Society and it was a great success for both. David led a large team of activists, technicians and photographers who have spent the best part of a year cataloguing and itemising Paddy’s extensive personal collection, and over 6,000 of Joan’s photographs. We were given a glimpse of some of the material which includes over 10,000 letters and postcards as well as numerous corrected drafts of Paddy’s manuscripts, and surviving journals of his post-war journeys around Greece and other beloved places. The collection takes up over 16 metres of shelving and the catalogue is eighty one pages long. Fortunately Paddy gave David and the team some assistance with his various boxes labelled “Detailed Oddments” or “Not very important oddments” and so forth. The story of the acquisition is interesting itself. The John Murray archive was donated to the museum in the 1980s and includes material from the authors published by the house including of course Lord Byron, Jane Austen, Charles Darwin and John Betjeman. The catalogue extends to over one million items and may have a value in excess of £100 million. When offered the PLF archive, the decision to purchase was not an instant yes as Paddy had no obvious relationship with Scotland. The decision to go ahead was based upon the relationship with John Murray, in particular John “Jock” Murray VI, and of course the recognition that Paddy’s work was unique and important in 20th century English literature. Given Paddy’s long life, his varied career, and the circle of friends that he had, many of whom were significant figures in their own right, David McClay’s view is that there is a lot to be uncovered and the material could provide the basis for further biographies. He cited as an example Paddy’s friendship with Greek artist Nikos Ghika; he believes that their correspondence is worthy of publication. Many of the letters include drawings and small paintings by Ghika. The propensity to illustrate letters was common (as we have seen in the letters to Debo Devonshire – see In Tearing Haste), and other examples include those from John Craxton to Paddy: one of Craxton’s letters includes a sketch of the harbour view from his house in Crete. Likewise the guest book from Kardamyli is full of wonderful material and colourful illustrations. Joan Fermor’s work should not be ignored. David McClay told us that she was a successful architectural photographer with an ability to bring her subjects to life which included many archaeological subjects. As we know she also took brilliant images of their friends. Clearly a man with all the vital talents to make him employable anywhere! One of the most important messages to bring to you all, dear readers, is David’s view that this is “your archive”: it is freely available for you to visit whether you be a professional writer, academic or merely just wanting to hold, touch and read the ephemera of Paddy’s life. You are encouraged to visit Edinburgh and can request information. Soon much more will be available online for you to use or just to browse and amuse yourself. This positive drive towards public accessibility was very encouraging, and whilst every care has been taken to ensure that the materials will survive – storage in proper archival folders in acid free environments – the archive is a living entity and to be of any value it must be accessed. McClay made a special appeal for people to come forward with ideas about the origins of certain pictures, including who may have taken them, where and when. Much work still needs to be done and you, his friends and fans, may be able to help. As well as the storage of the material and the process of digitisation of some items, the Library has plans to publicly display as much material as possible. I will keep you posted about events but David anticipates exhibitions in Edinburgh and then on tour to London. The renowned water colourist Hugh Buchannan has made some paintings of material from the archive which will feature in an exhibition of the Esterhazy Archive. These works will be on display at the NLS in the summer of 2015 and will move to London to be shown at the John Martin gallery in, of all places, Albemarle Street just up the road from John Murray. It didn’t take long during the Q&A session for the subject of “the house” to come up. Charles Arnold, the leading light behind the PLF Society handled this one. It appears that the Society has engaged a leading law firm as well as accountants KPMG to work with the Benaki to establish a structure for the proper and transparent use of any funds that the Society may donate for the upkeep and renovation of the house at Kardamyli. We wish them luck with that! This entry was posted in Patrick Leigh Fermor Society and tagged David McClay, Hellenic Centre, National Library of Scotland, Patrick Leigh Fermor Society on January 20, 2015 by proverbs6to10. After reading this blog for the last months, I thought it appropriate to add my own footnote. Having read Paddy’s first two volumes of his walk and Stanley Moss’ book on the Kriepe kidnapping, I was just about to launch off, in 1989, to spend the winter in the Amari Valley on Crete to make a video documentary on village life. I sent a letter to Paddy asking whether he thought that the village of Vizari in the Amari might be an appropriate local for my plans. He replied that it was as good as one could get. And off I went for several months. A second letter from him, about two weeks after I was settled in the village, included greetings to a number of families in Vizari. Their surviving members were thrilled to get this salutation and told me stories of Paddy and his associates in those dark days, how they had smuggled food to him and his friends who manned Tom Dumbabin’s radio shack, hidden amongst stone ruins on the valley floor. Their remembrances were fond and deep and I was moved just as deeply. Such a turn of fortune to find a central place to land. Before I left the Amari Valley (to which I return for years after, even buying and ancient stone house there), Paddy invited my wife and I to come “for a drink” at Kardamitsi before we returned to the States. Unfortunately, our airline tickets did not allow us the time. And, since then, I’ve always felt that something has been missing that should have passed with the ease that good meetings averr…. My friends in Vizari are still the bedrock of my memory. ….this is such good news,& congratulations to all the dedicated people who brought this to fruition.What about Paddy & Joan’s house in Kardamyli ,Greece?One report seemed to suggest it was deteriorating & was occupied by ”squatters”-that would be shameful….the Benaki Museum would need assistance in maintaining the house & contents,given the dire economic situation in Greece…….Evangelia…..
Delightful! Always great when curators are so enthusiastic and informative. Love the CV of Xan Fielding.